Firstly, I made a new video! Recently I've been around my other half's mums house for a few evenings, washing clothes as our tumble dryer is temporarily out of action (belt snapped). Anyway, I saw some cake and had to make a video about it. You can see it here. Or just watch it below. Apart from that, I have this habit when I'm excited of kind of flicking the hair towards the back of my head with my fingers. I haven't done it for ages but while I've been watching some TV at my other half's mums (Hornblower is surprisingly good) I've caught myself doing it at the end of a couple of TV shows. Anyone know why I do it? Very odd. Temporarily not thinking about myself for a minute, it's seriously scary what's happened in the US with Hurricane Sandy. I know that I'm not prepared sufficiently if there's an emergency around here, despite this part of Hull being hit with flooding only 5 years ago - and North Hull being hit with a flash flood only about 2 months ago. Must do better. 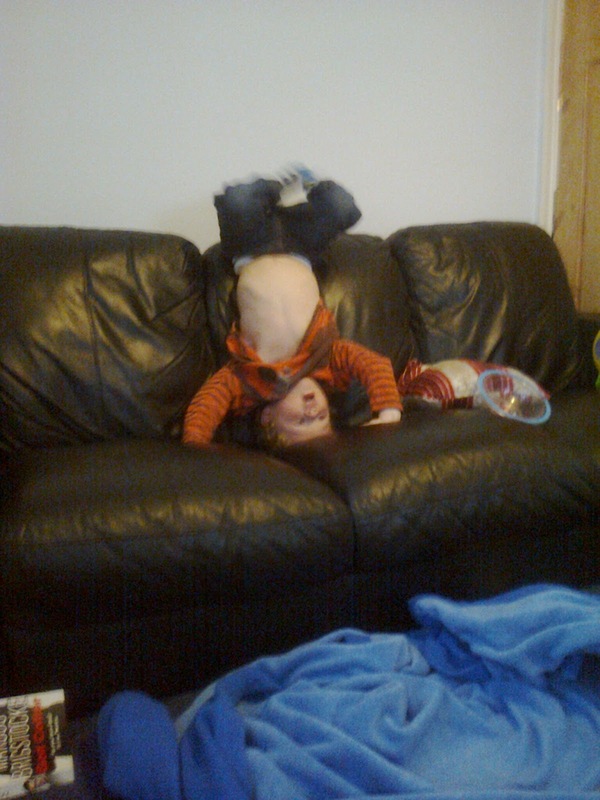 Let's finish the post with a picture of my son standing on his head. For the observant folk, that's a book by Marcus Brigstocke in the bottom left corner of the picture - or M-A-C-U-S B-I-G-S-T-O-C-K-E if my son's reading it. The guy will just have to leave the R's out of his name until the little one can say them.